In this article, we’ll implement a basic Kotlin function and deploy it as AWS Lambda. AWS Lambda is a serverless architecture which lets us to run code without managing servers and the main advantage of this architecture is, this function executes only when needed and scales automatically. AWS charges only for the compute time and there are no charges incurred when the code is not running. For basic usage we no need to pay anything we just need AWS account. See this link for AWS lambda pricing. Free tier gets 1M requests and 40,000 GB-seconds of compute time per month. This limit is more than enough for our simple application. This command will install serverless globally. This whole project is available here. We created new folder hello-kotlin for our project and moved into it. sls is the shortcut command for serverless so I used short version. We are creating new project so mention create as sub-command by providing –template to it. In our case we need Kotlin project so I passed aws-kotlin-jvm-maven. Click here to see complete list of available templates for AWS. In the next section we will learn about the generated function and configuration. Class Handler implements RequestHandler interface which contains single function handleRequest. We need to implement this function because it is the starting point of lambda execution. AWS executes this function by passing input and context. These objects are needed if you want to read input from the request and context is to get the context of execution environment. handleRequest function uses two utility classes Response.kt and ApiGatewayResponse.kt to construct the Response. In this case we are building the response by setting statusCode to 200 and Response with some text and adding custom header ‘X-Powered-By’. This is a simple function with out much functionality it just responds with some text. serverless.yml comes with basic configuration. I removed everything it comes with and replaced with below configuration. Properties in this file are self explanatory. service is a unique name for this function. provider contains provider specific configuration. package is the artifact name which is generated in the target folder at the build time. functions contains list of functions with there configuration. Each function needs the handler. Handler is the class which implements RequestHandler and we need to provide the events on which this function gets triggered. There are many ways to trigger functions like HTTP, CRON or event based. Here we want our function to get executed when it receives a HTTP request on hello path. In-order for serverless to connect AWS it needs our credentials because it will upload and deploy lambda on behalf of us. Follow below steps to configure this. Go to Security Credentials page by clicking on the user name at the top right of the page and selecting My Security Credentials from the drop-down menu. Under Access keys click on Create New Access Key which will create new keys and displays them in the new dialog. Click on Show Access Key to view them. Remember to save these values because later you may need them for the reference and keep them securely. Replace Access Key ID and Secret Access Key with the values displayed in the AWS Console. It takes some time to deploy. Once the deploy completes then the output shows some key information. Copy the endpoint which is displayed after deployment to your browser and hit. If everything goes normal then you should see response from our function. Our function responds with the message and HTTP headers. You can go to AWS lambda console to see more details about this function and also you can even test it from there. 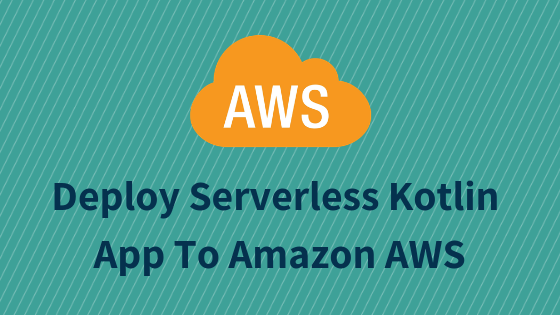 We created a simple Kotlin function and deployed to AWS lambda using serverless. This function returns a text along with HTTP headers in the response. Click here to access the source code.